All Rootstocks listed below are available including virus free selections. Quince A is more vigorous that Quince C although not as precocious. Quince A produces heavy crops with larger fruit size, and that the winter hardiness of exceeds that of Quince C.
Quince C has been proven to be more dwarfing and precocious than Quince A. It is considered to be more hardy than Quince BA 29-C.
Precocious, very high-yeilding and produces trees anywhere from 1/2 to 2/3 the size of standard pear trees. 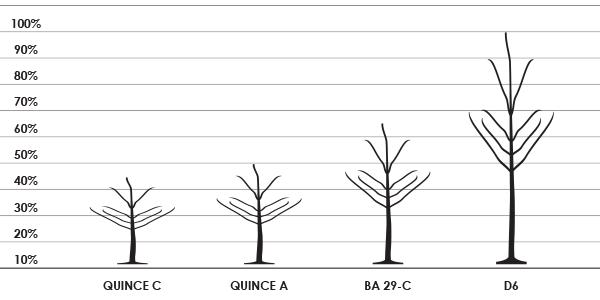 Ba 29-C is incompatible with some pear varieties, resulting in the use of an interstem, or stem piece between the scion variety and the understock. Pyrus calleryana D6 seedlings are the most commonly used rootstock for commercial pear production. D6 is slow bearing and excessively vigorous – producing very large trees.